I love when you can combine learning and fun! This colour mixing sensory bottle does just that. It brings science and the wonder of discovery to sensory play. 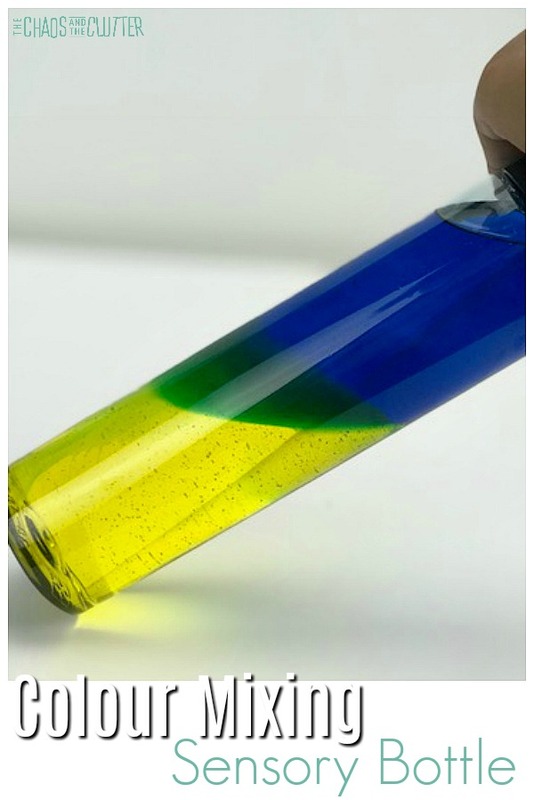 This activity is effective for teaching the science concepts of colour (for younger children) and density (for older children. By using different densities, the two colours are able to mix to form a new colour and then separate again. When held up to the light or sunlight, the colours created in this colour mixing sensory bottle are beautiful. Even I was surprised at how cool this simple science activity was. I wasn’t sure if it would work and was delighted when it did. My kids were even more delighted! Due to the weight of the corn syrup, these sensory bottles are on the heavy side, making this a wonderful activity for proprioceptive sensory input. These also of course involve the visual sensory system as children use their eyes to explore the colours changing. 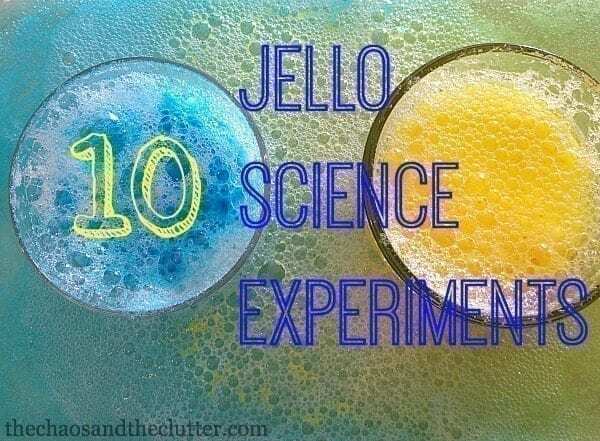 In a glass or clear plastic container that is similar in size to the empty water bottle, add clear corn syrup and a few drops of yellow food colouring. Mix well. 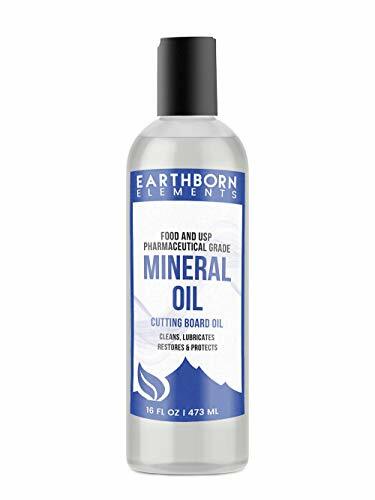 In another glass or clear plastic container that is similar in size to the empty water bottle, add mineral oil and a small bit of blue food colouring paste*. Mix well. Add a very small amount of the dye as you can always add more once you see the colour. You don’t want the blue to be too dark. Pour the yellow corn syrup mixture into the empty water bottle to about the halfway point. You may need to use a spatula to get it all transferred. Next, pour the blue mineral oil to nearly the top. Top with the lid. If you want to secure the lid, you can do so using a hot glue gun. *It is important that you use an oil based food colouring in this step. 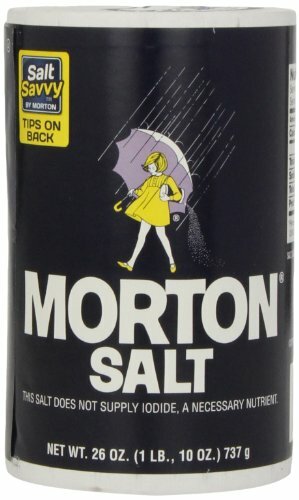 Water based dyes will not work. The yellow and blue should stay separated when the bottle is upright. If you tilt the bottle, you will begin the see the colours combine to form green. 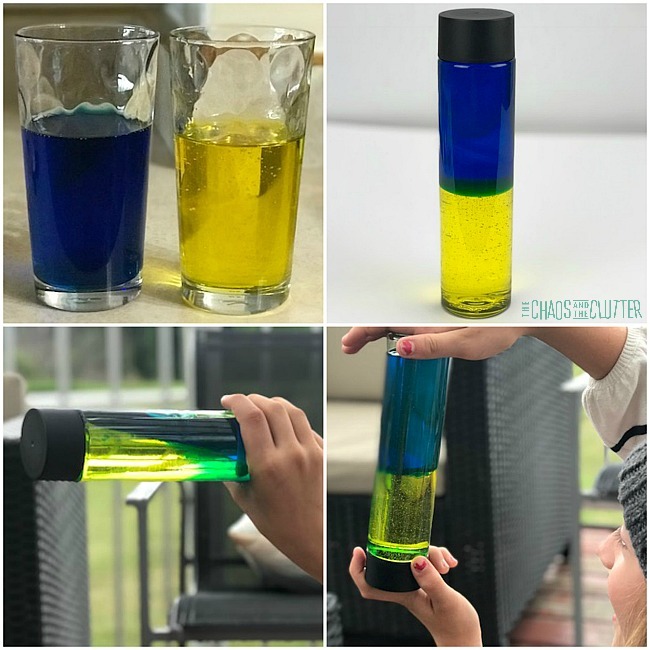 You can create other colour mixing sensory bottles by adding yellow and red which when combined will make orange and blue and red which will form purple when mixed. Note: It works best to have the lighter colour be the one that is mixed with the corn syrup. What makes the colours separate? The difference in densities between the corn syrup and mineral oil is what keeps the colours separate. They sit on top of each other unless tipped. 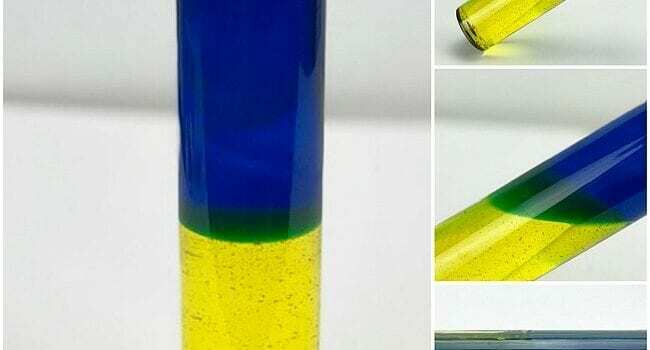 The colours will then mix to form a new colour, but when brought upright again, the colours will separate because of the density of the liquid they are in. 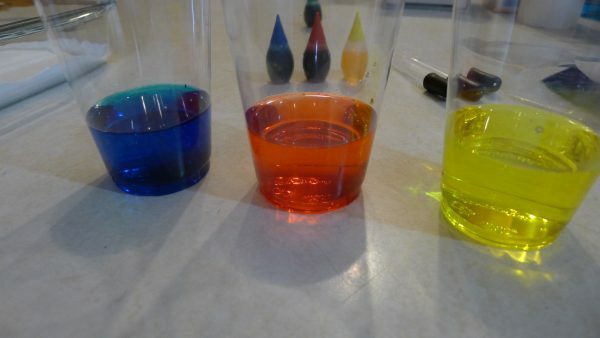 For younger children, give a simple explanation on density, but focus most of the science lesson on the colour mixing. 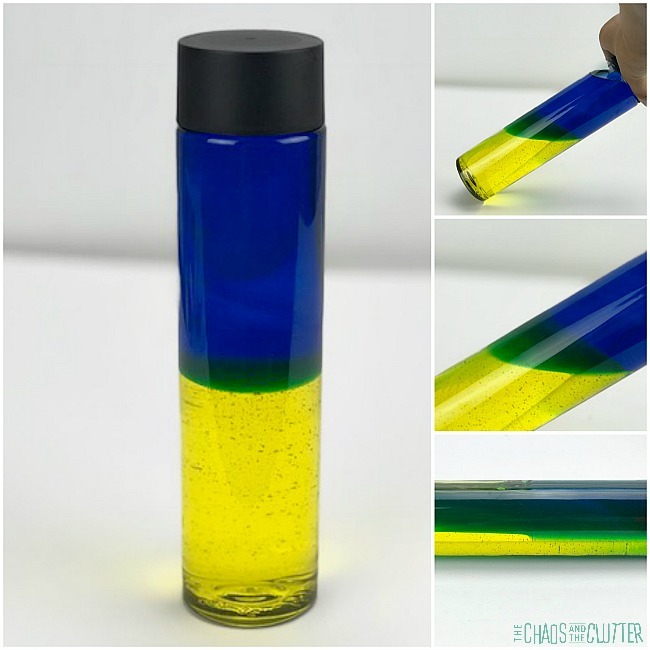 For older children, use this science experiment as a way to introduce density. Follow up with this video that helps further explain density. You can then expand the discussion from there. This activity appears in the Colours section of The Sensory Science Book Volume 1. In it, you can find other incredible activities to help children discover the world around them. Experiment with other colour mixing examples. If you’re looking for more fun ideas for your child, get a free sample of our Sensory Play Recipes eBook. 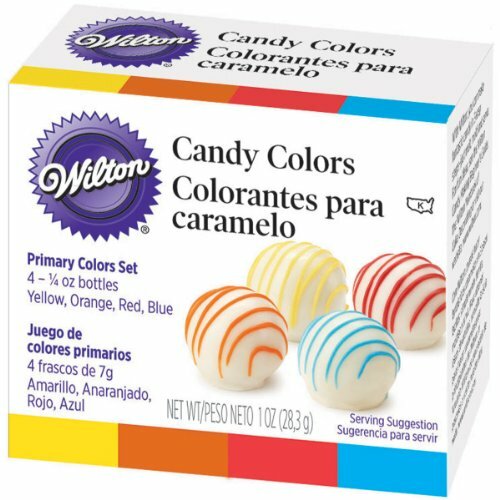 Of course, for the next two versus, you make orange by “hugging” red and yellow and make purple by “hugging” red and blue. We did a few easy color mixing experiments. 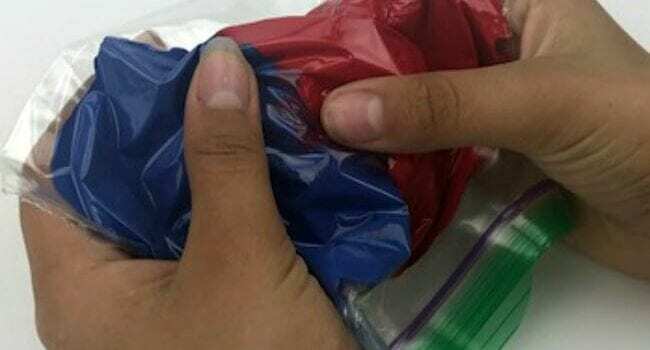 Squirt some blue paint and red paint into one bag, ensuring that the paints are on opposite sides of the bag. 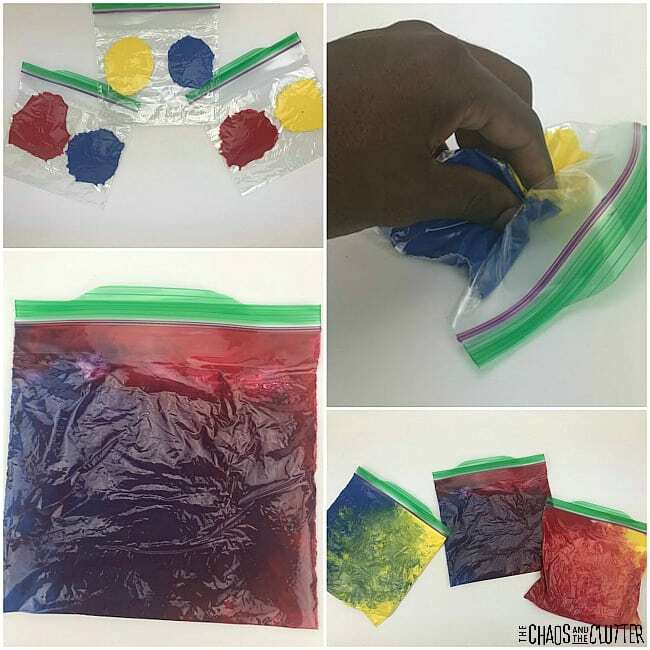 Do the same in other bags with blue paint and yellow paint in one and red paint and yellow paint in another. Seal the bags, removing as much of the excess air as you can. Discuss primary and secondary colors. Have the child hypothesize what colours will be created when the paint is mixed. Have the child mix the paints together with their fingers by moving the paint around through the bag. 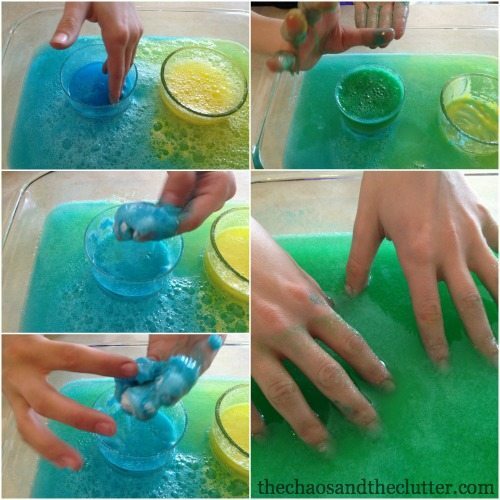 This is a great sensory activity too. The kids are able to create other colours by squishing the primary colours into each other. You can hang the bags on the window using clear packing tape and have the child observe how the sun shining through affects the appearance of the colours. This experiment is one of many included in the first volume of our Sensory Science Book. It is full of engaging hands-on learning designed to help kids retain what they learn because of using their senses in the process. 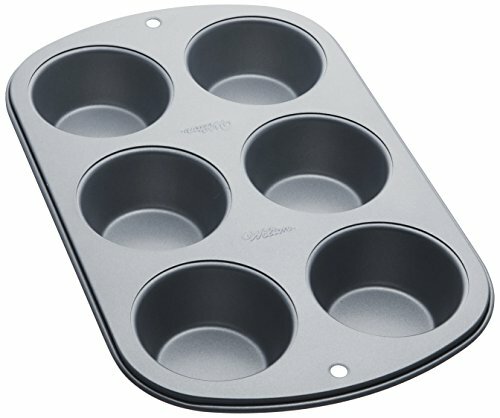 Place a layer of baking soda in a cake pan. 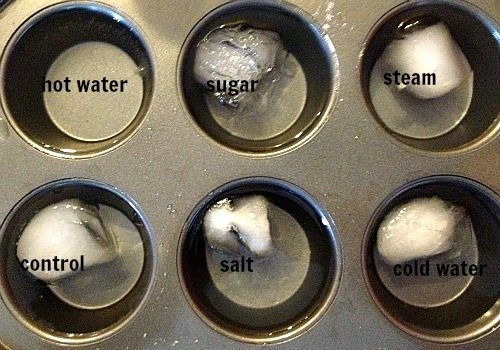 Fill three cups a third of the way with vinegar and add about five drops of food colouring to each cup. Fill the droppers with the coloured vinegar and squeeze it out onto the baking soda. 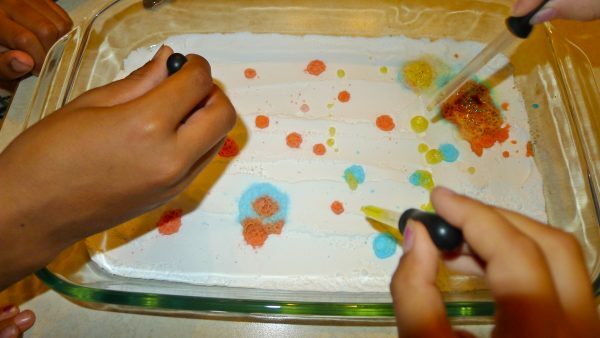 By adding another colour on top, you can create little volcanos of new colour in mixing them. -that the best way to form a new colour was to have a person with one dropper of one colour and another person with another colour squeeze at the same time in the same area. Once left on the baking soda, the colours did not mix as easily. -that mini volcanos are fun. -that when you pour the three glasses of color into each other, you end up with almost black. 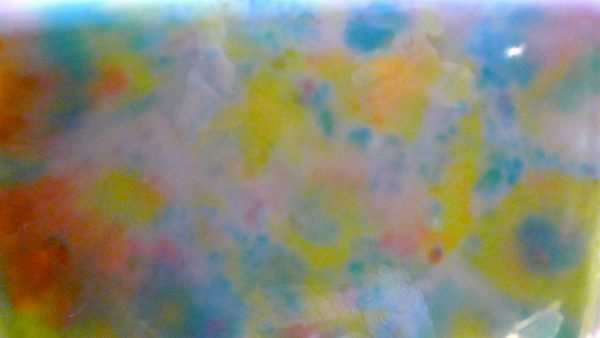 The kids especially liked the look of the bottom of the cake plate after we were done and wished we could hang it like artwork. Unfortunately, a picture of it will have to do! The kids also completed a great colour mixing worksheet (find it here) and had fun with some Mandala coloring pages that I printed for free from here. They also had plenty of opportunity for hands-on learning on colour mixing with paint. What’s the Point of Sensory Bins, Bottles and Bags? One of the more recent trends in sensory play is the creation of sensory bins, sensory bottles and sensory bags. 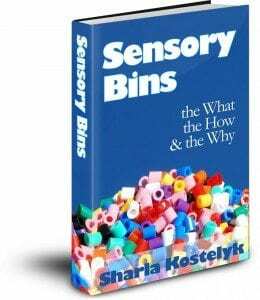 Perhaps you’ve wondered what the point of sensory bins or sensory bottles or sensory bags is. Are they simply another toy? Why do children seem so enthralled with these seemingly simple sensory activities? I hope to be able to answer these questions for you. Sensory play is important for all children at many of their developmental stages. 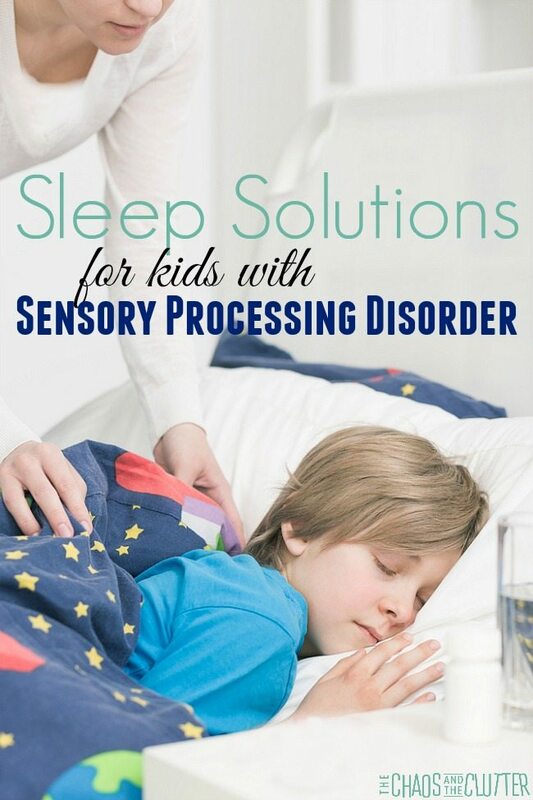 It is even more critical for children who have sensory processing disorder (SPD). Sensory play is any activity that stimulates the sense. So why sensory bins, sensory bottles and sensory bags? 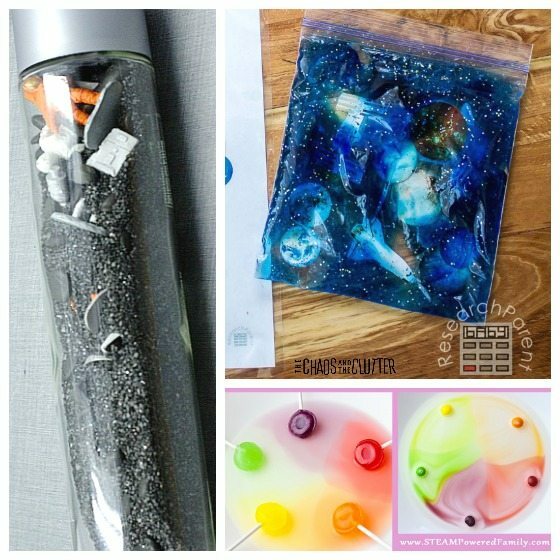 Sensory bins, bags and bottles are easy and inexpensive to make. They don’t require a lot of room. This give children the opportunity to further their sensory exploration without the need to go to an indoor play place or children’s museum. 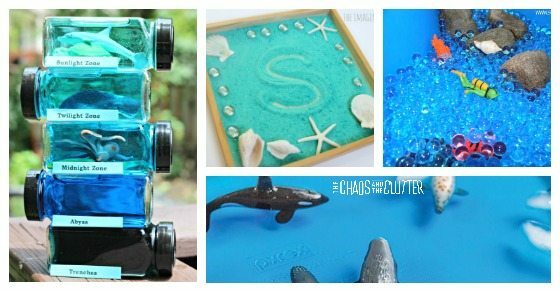 They are an incredibly simple way to incorporate sensory play in your own home or vehicle or classroom. Sensory bins, sensory bottles and sensory bags allow children to explore, discover, imagine, create, and learn while engaging their senses. If you’ve ever made a sensory bin for your child before, you may have noticed that it captured their attention more than you expected it would. Often, kids who will only play with a toy for a few seconds or minutes will spend ten or fifteen minutes playing in a sensory bin while their mom or dad stands there, mouth agape, wondering how in the world their active child is staying focused on one activity for so long. This is because of the sensory component of the play. 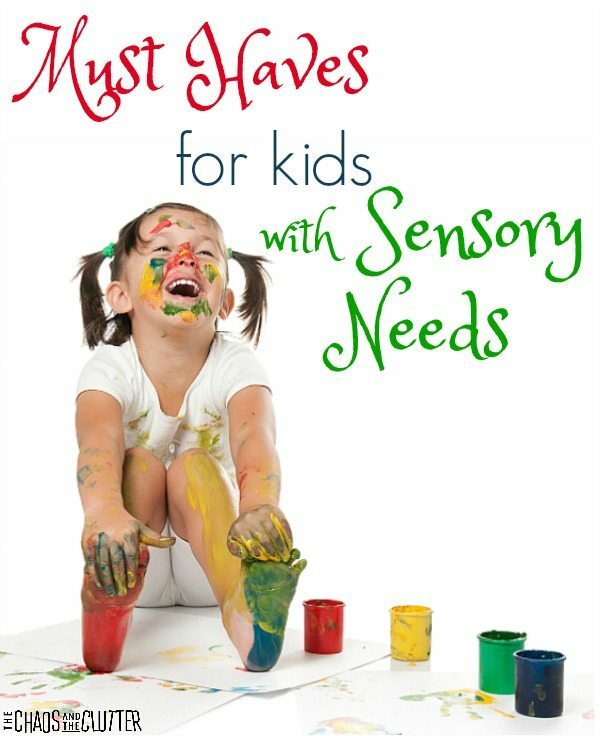 Your child is not able to tell you when their sensory needs are not being met, but when they encounter an activity that fills that void for them, they know immediately that it is something they need to be doing. 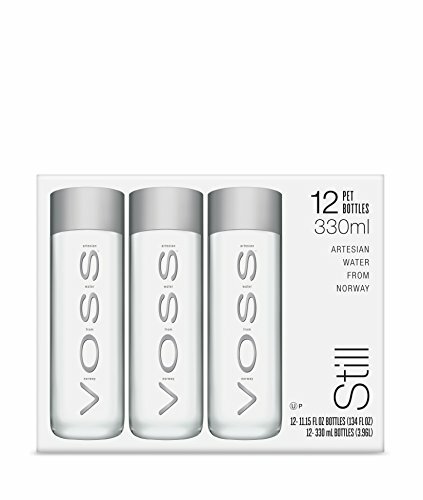 Sensory bottles are often referred to as calm down bottles. 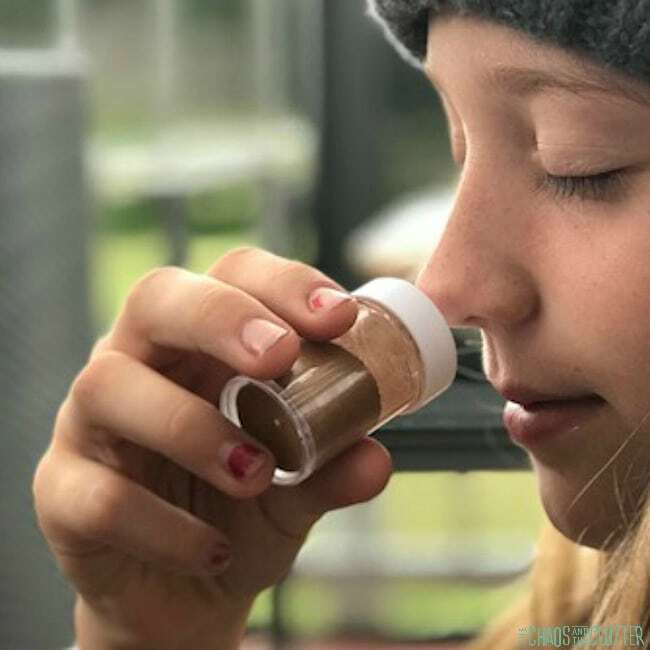 When a sensory bottle has items such as glitter in it that move slowly, children (and adults) are often mesmerized by watching their slow descent and this calms their breathing and helps them regulate themselves and their emotions. I also have created weighted sensory bottles for much the same reason. 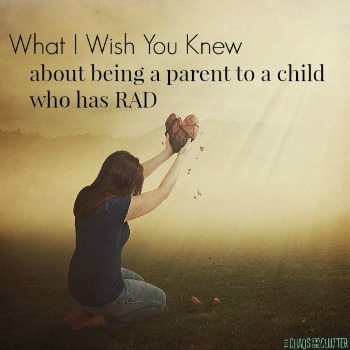 They can provide a calm down effect due to the sensory input they provide. 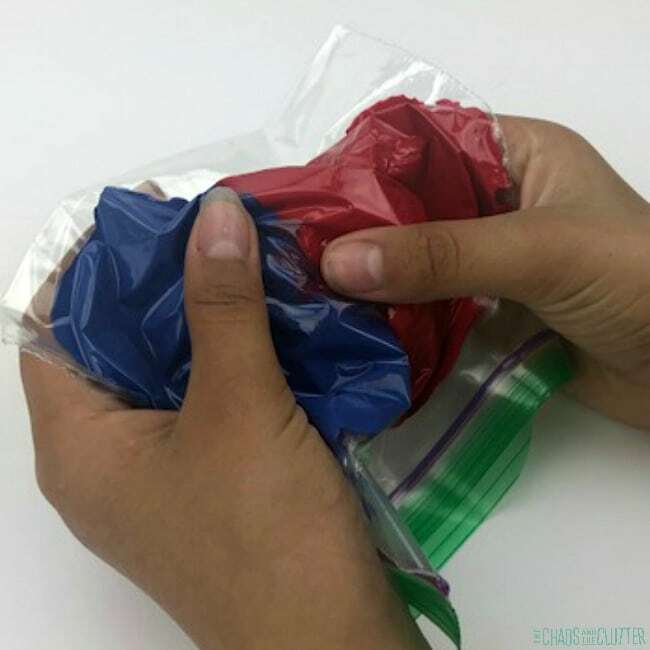 Sensory bags are often referred to as squish bags and they also meet sensory needs in a simple way. I make freezer meals and often when I’m assembling them, my daughter will press on the bags of soups and casseroles and comment how much she loves the feeling of them. When it comes time for me to put them in the freezer, she expresses that she is sad to not be able to play with them anymore, so I whip up a simple sensory bag for her to play with. 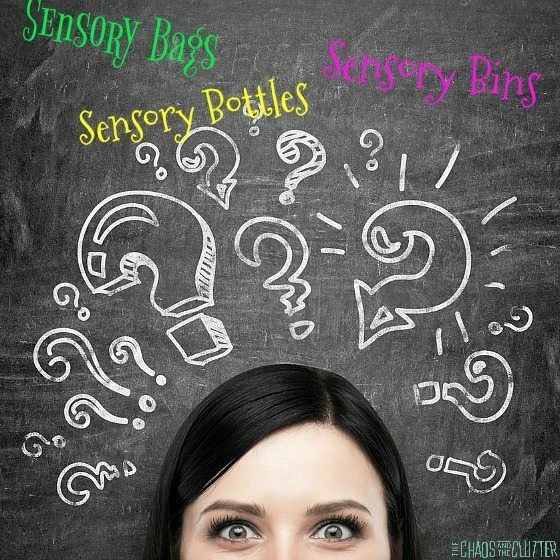 What are the benefits of sensory bins, bottles and bags? Language Skills – Children are able to expand their vocabulary and language skills as they describe their play experience. Fine Motor Skills – Fine motor skills are improved by manipulating small objects, dumping and scooping. 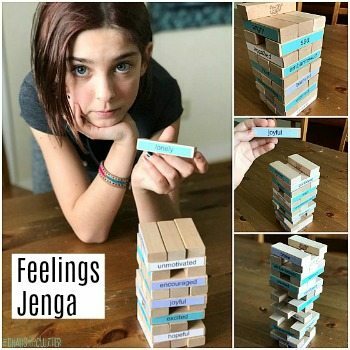 Social Skills – Social skills are worked on by learning about sharing, playing and communicating with others while engaged in their sensory play. 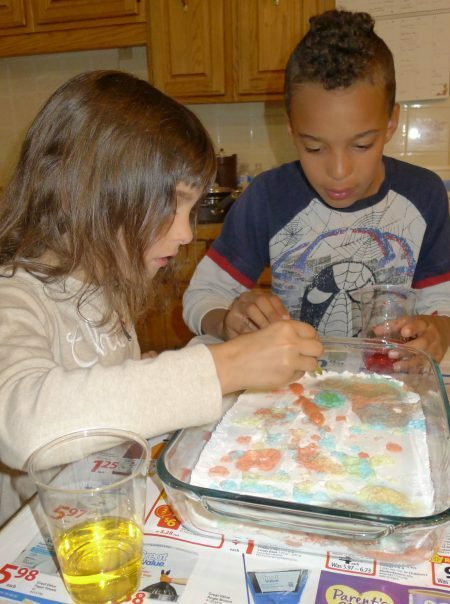 Science and Math Skills – Children are also using skills useful for science and math in measuring, guesstimating and learning about cause and effect while manipulating sensory materials. What are other uses for sensory bottles, bags and bins? Two of our children have used sand trays in their therapy. Sand trays are especially appropriate to help children work through past traumas. I believe that my children were more comfortable doing their sand tray work because they were so used to sensory bin play. Those who work with patients with dementia and Alzheimers are finding it helpful to use sensory bags, bottles and bins. Providing appropriate sensory stimulation for patients suffering from Alzheimer’s and other forms of dementia has been shown in recent studies to decrease agitation and restlessness and to improve sleep. Obviously, for adults, you don’t want to create a sensory bag that is too juvenile, but you can create the same effect using something like this gel bag maze. Some patients do enjoy themed or fun sensory bags. Simple sensory bins with rice and rocks or salt can be very effective and sensory bottles can have a calming effect. Sensory bottles, bins and bags are particularly effective for children who suffer from Sensory Processing Disorder (SPD), though they are also a healthy part of learning for all children. How do I use sensory bags, bottles and bins with my child? Sensory bins are very simple to create. 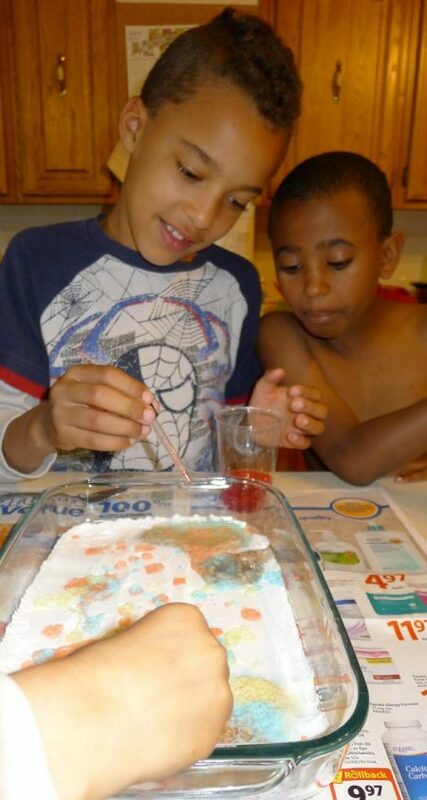 You likely have supplies in your home today to make a sensory bin that would engage your child. If you are looking for more in-depth information on creating sensory bins including filler ideas, sensory recipes and storage and money saving ideas, you can find those in my ebook on Sensory Bins. 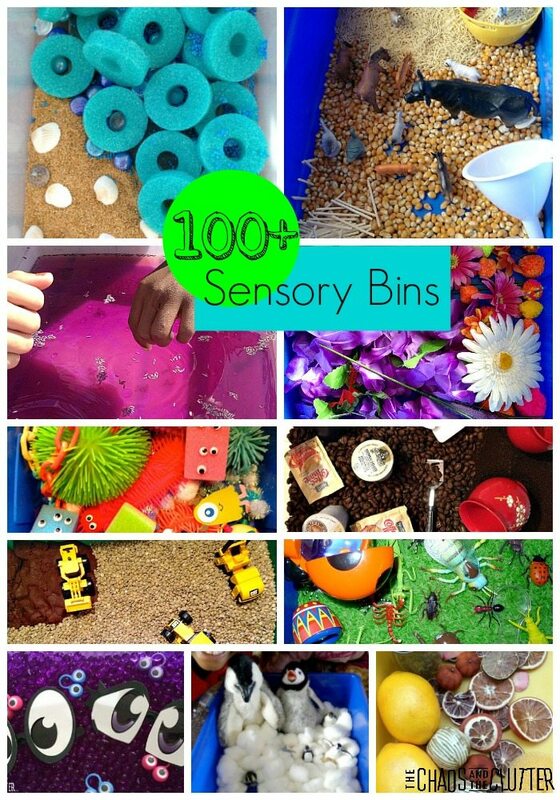 If you’re looking for inspiration to create your own sensory bins, here are over 100 sensory bin ideas for all kinds of themes and holidays. Help your child explore by asking them questions like “what do you feel?/see?/smell?” or “what does that make you think of?” Encourage them to use their imaginations to come up with stories or characters while they play. 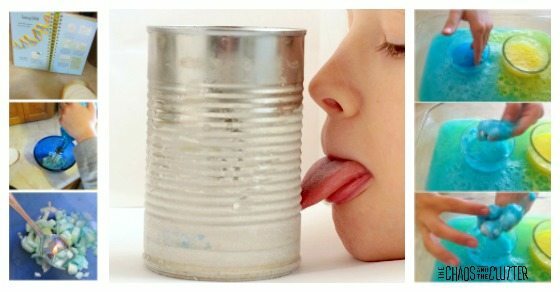 This is particularly effective in sensory bins. Sensory bottles can be created in any empty bottle that has a lid. For younger children, I suggest hot gluing the lid on so that they can’t open it. You can fill the bottle with liquids or solids and a variety of items. If you mix clear glue with warm water (approximately half and half), you can slow down the movement of the items in the bottle, adding to the calm-down effect. Adding heavier items or using a glass bottle (not for younger children obviously) creates a weighted sensory bottle. 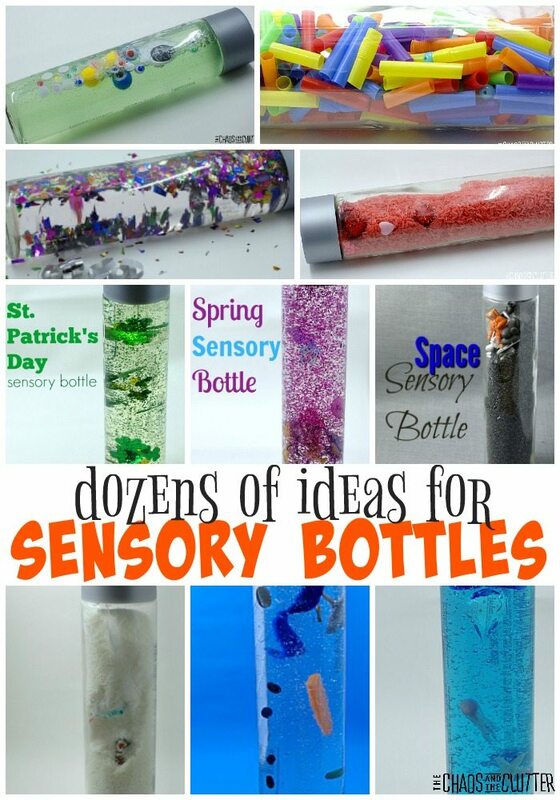 For exact instructions and over a dozen ideas to help you create your own, check out all of our sensory bottles. 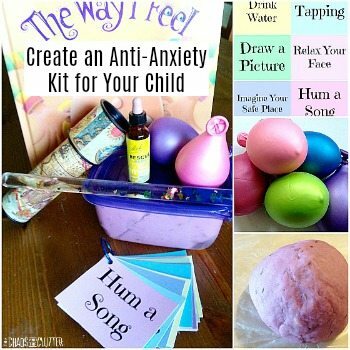 Sensory bottles and bags can be used for calming or exploration. They can also be good for taking with you in the vehicle or using in waiting rooms. 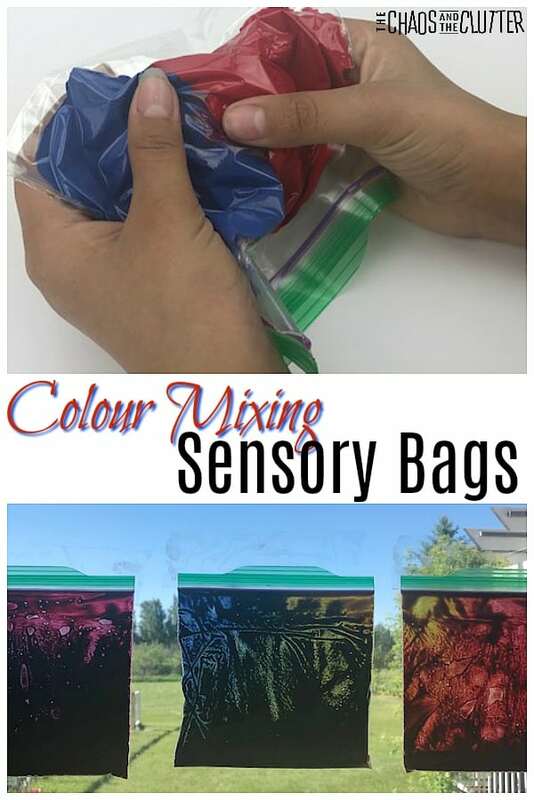 Sensory bags are also very easy to make. I like using medium freezer bags instead of sandwich bags because I find them more durable. 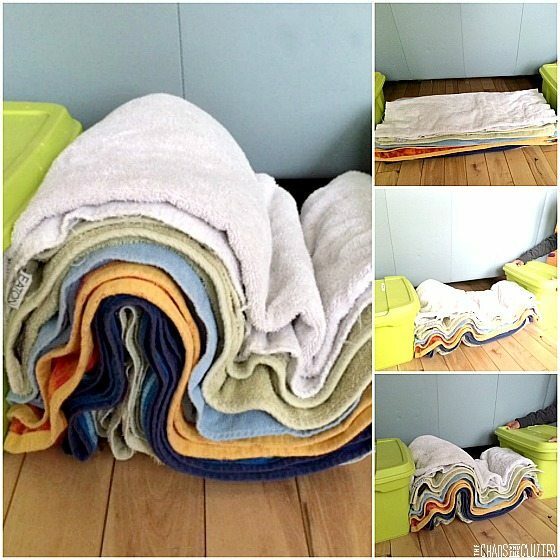 If you are making them for younger children, you will want to secure the bag with duct tape or heavy packing tape. They can be filled with a variety of items. 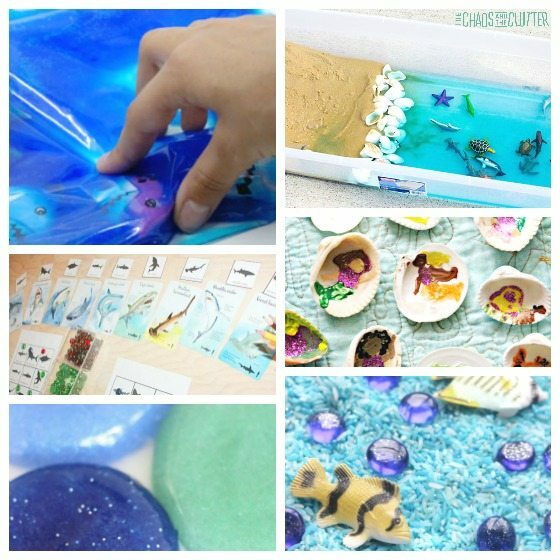 If you’re looking for ideas for making sensory bags, you can check out our best sensory bags. 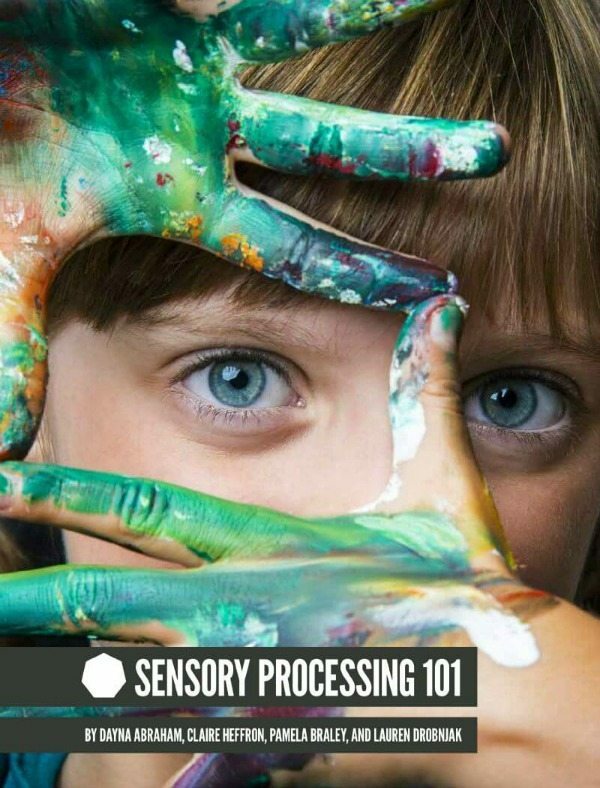 Creating sensory activities doesn’t have to cost much. I find that the dollar store and my own cupboards are great places to find sensory filler items. I’ve used expired coconut as “snow”, coloured expired rice, used all shapes and sizes of dry beans and lentils and chickpeas, popcorn kernels, oats. Gels, body wash and hand sanitizers work well in sensory bottle and bags so I am always on the lookout them to go on clearance. 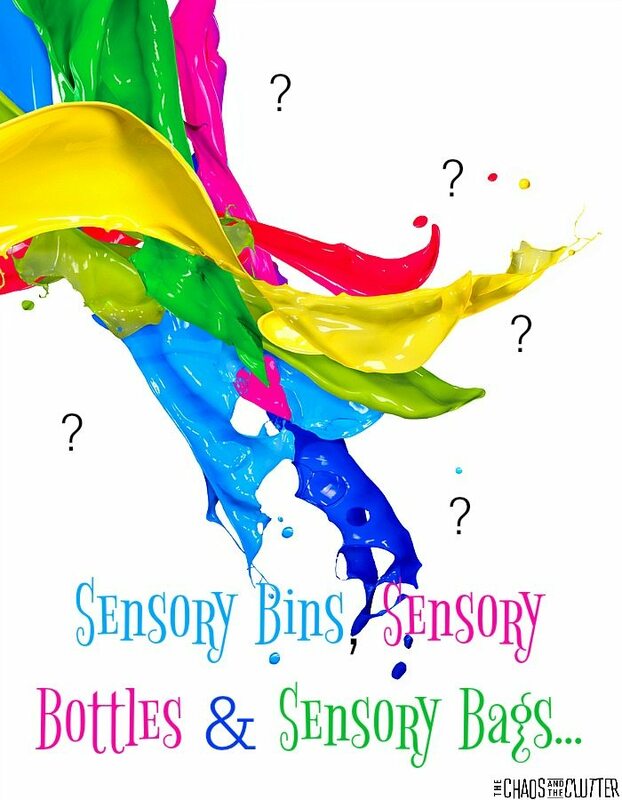 I hope this information has given you a better understanding of the purpose of sensory bottles, bins and bags and given you the knowledge and confidence needed to be able to make your own. 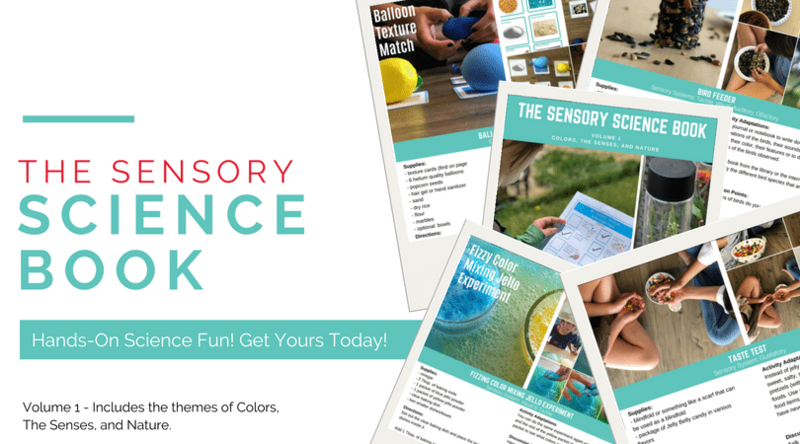 Join our free 5 part email series Sensory Solutions and Activities and get our Sensory System Behaviours Easy Reference Cards. 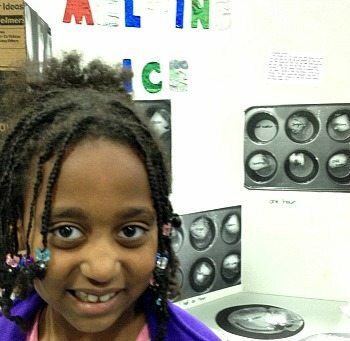 Dancing Queen wanted to do her Science Fair project on melting ice. 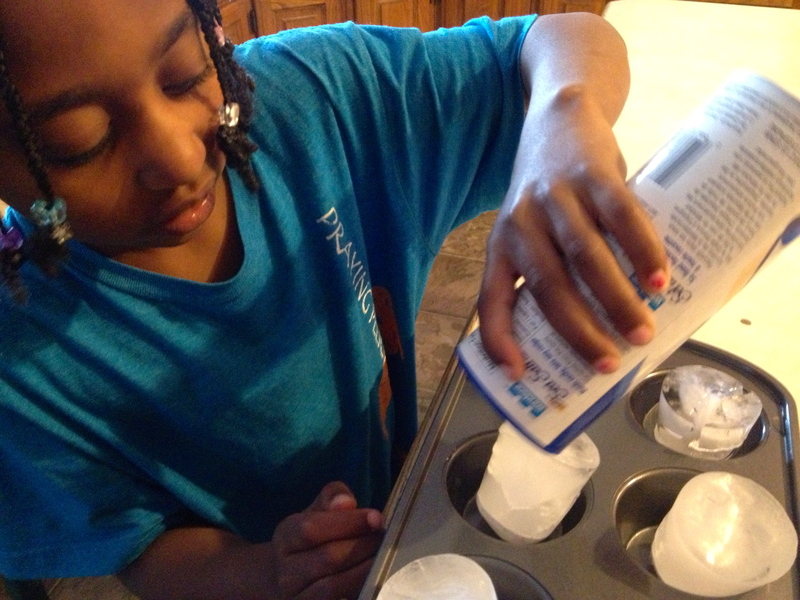 She was curious about what would make ice melt faster. 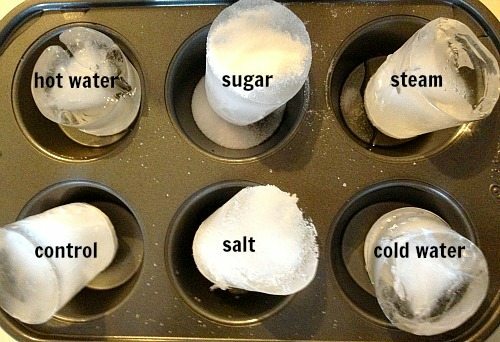 This is a simple science experiment to do with items you likely already have in your kitchen. Before beginning the experiment, have students talk about what they expect the results to be. 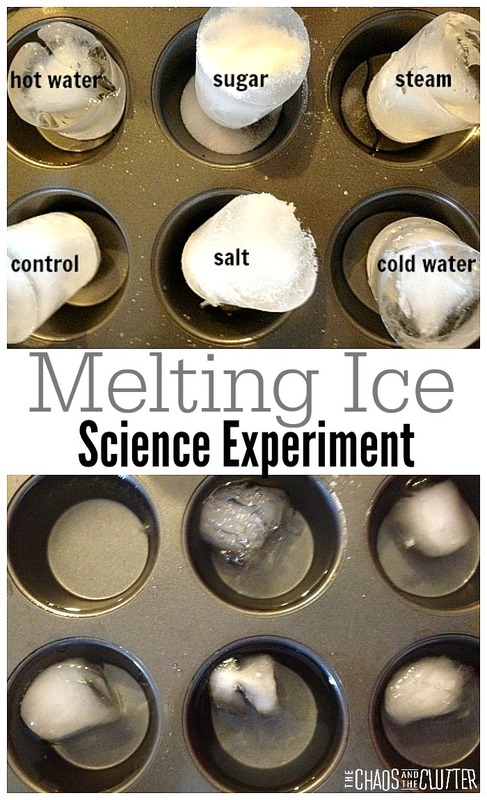 Ask them what variable will melt the ice fastest. Fill 6 small Dixie cups with water. Freeze overnight. 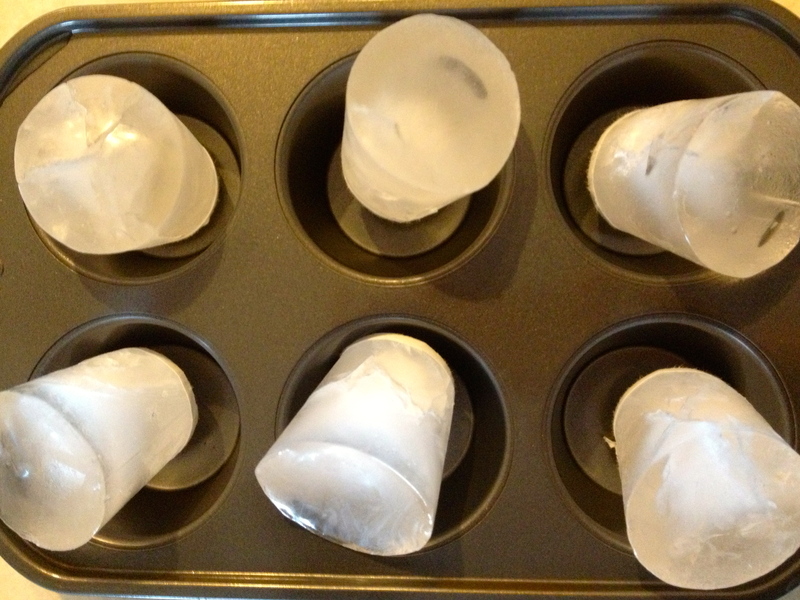 Cut the frozen water out of the cups (adult help may be required for this step). 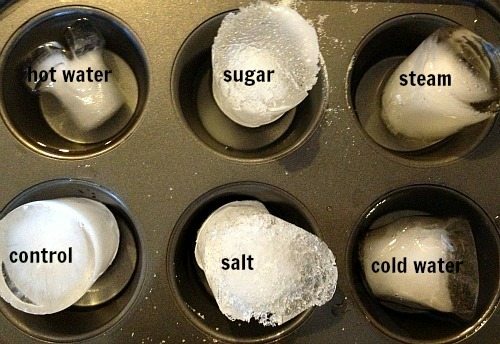 Place one in each of the compartments in the muffin tin. 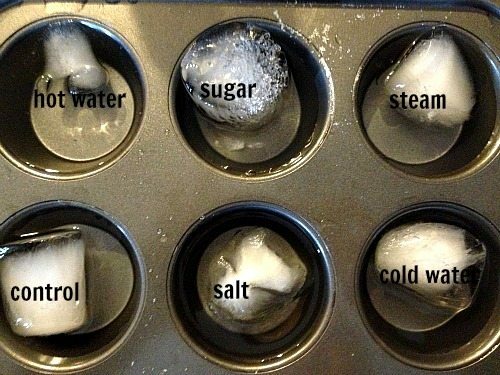 Pour hot water on one, cold water on another, steam on another, salt on another, and sugar on another. Leave one alone so that it can act as the control. Adult supervision is important, particularly with the steam and hot water. Students can document the progress through taking pictures or journalling observations at one minute, five minutes, half an hour, and one hour after adding the variables. As you can see, the control did melt slower than any of the others. Hot water melted the ice the fastest. Dancing Queen then dictated to me what she had observed during the experiment and we included that as well as a picture she drew of the process and the photographs on her display board for the Science Fair. 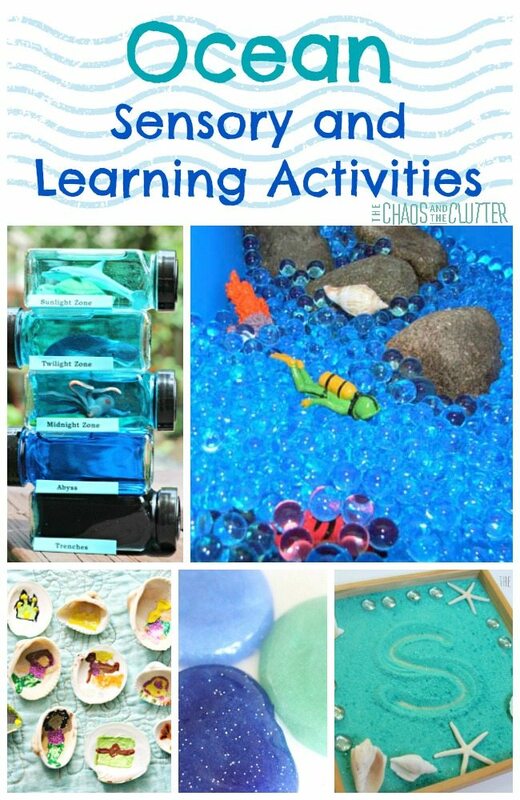 I decided to feature Ocean sensory and learning activities this week. With the beautiful weather, it’s easy to be dreaming about an oceanside vacation! I’ve divided the activities into sensory and learning, but many of them fit into both categories. The ocean is so much fun to learn about and to explore. 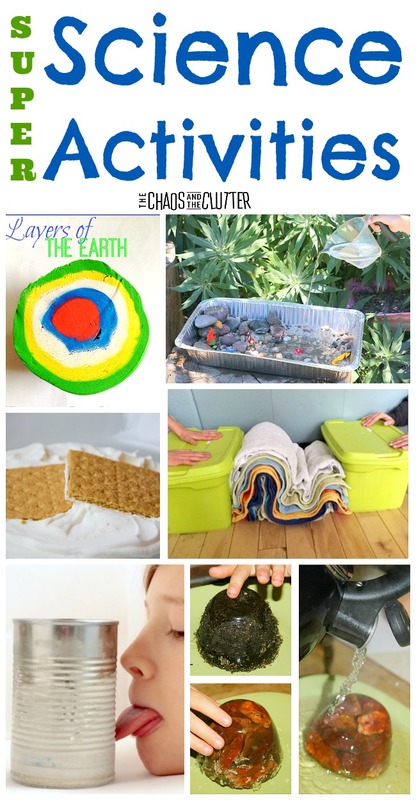 You will likely enjoy these activities as much as your kids will. 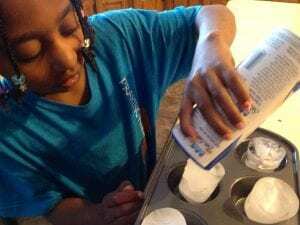 These are fun science activities that can be done with kids and many of them use items you probably already have around the house!